How does the brain’s spatial map change when we change the shape of the room? London, UK – March 9, 2018 – Our ability to navigate the world, and form episodic memories, relies on an accurate representation of the environment around us. This cognitive map, which is thought to reside in the hippocampus of the brain, gives us the flexibility we need to find our way around in familiar places and to store the events we experience in our day-to-day lives. Place, head-direction, boundary, and grid cells are thought to constitute the main units of this neural positioning system, the 'GPS' of the brain. Place cells identify the current location, head-direction cells provide compass-like information about directions, and boundary cells measure distances from landmarks such as the walls of the enclosure in which the animal finds itself. Due to their periodic firing pattern in standard symmetrical environments such as squares and circles, grid cells have traditionally been thought to represent the spatial metric system of the brain, or the coordinates of the GPS system, with place and border cells acting to stabilize the grid. A new study, published today in Science, explores the consequences of distorting the shape of the enclosing box on these cognitive maps of space. The results detail how our cognitive maps adapt to changed environments and shed light on how distinct types of neurons may connect to form these maps. Previously, it had been shown by lead author Julija Krupic and her colleagues that boundaries can influence grid cell symmetry, but how they did so was not clear. In the present study, they recorded from a region of the hippocampal formation called the medial entorhinal cortex as rats foraged for food in environments with differing shapes and borders. They found that the grid cells closer to the changing walls shifted more than those further away: the grid rescaling was not homogenous. Julija Krupic, a lecturer at the University of Cambridge, said "This was an exciting finding since it opened up the possibility that the loss of the symmetrical pattern in polarized environments might mean that the grid cells are not providing the spatial metric for the map. We realised they could still do so however only if they all reacted in roughly the same way to the changing walls. We examined this possibility and it turned out to be the case." One of the other authors, Marius Bauza of the SWC, used a large data set of simultaneously recorded grid cells collected using a state-of-the-art Neuropixels probe and carried out the decoding computation to see if a computer program could accurately identify the animal's location on the basis of the distorted grid patterns: "We wanted to see if the rest of the brain could still use these distorted patterns and indeed found that that was the case. We don't know that it actually does this but it certainly is possible." To elucidate the mechanisms underlying the interactions between grid, place and border cells, the researchers also recorded from place cells in a region of the hippocampus of the brain called CA1, in some cases at the same time as the grids. One popular idea is that the firing fields of these place cells are formed from the interaction of several grid cells. 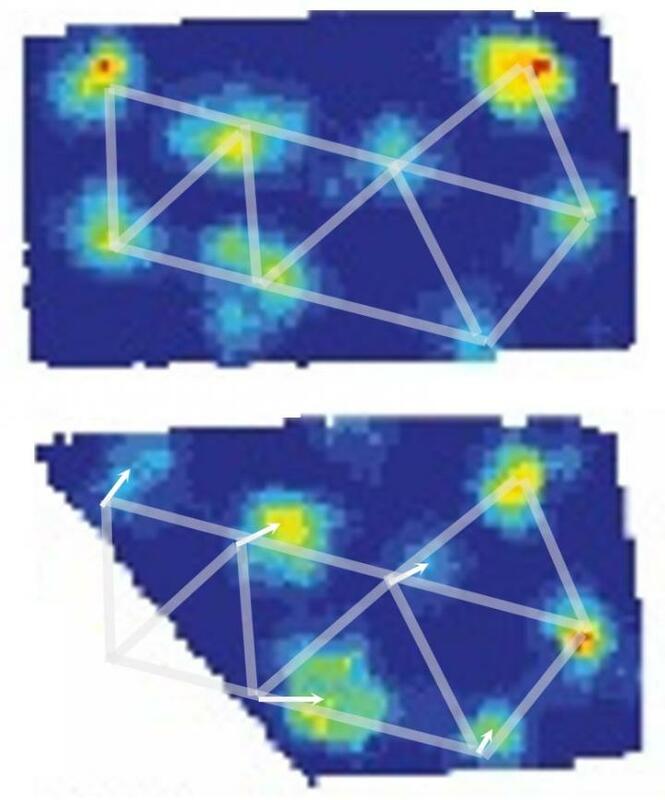 However, in the present study, they found that, while place cells also undergo a similar pattern of shifts in relationship to the moving wall, the size of the shift did not significantly correlate with grid cells, indicating that while some place cells may be interacting with grid cells, others are not and there looks to be a more complex relationship involving border cells too. Senior author John O'Keefe remarked in conclusion that "we still have a lot to learn about the way in which the spatial cells of the hippocampal formation represent the environment and interact to form our cognitive maps". This research was supported by grants from the Wellcome Trust and the Gatsby Charitable Foundation. J.K is a Wellcome Trust/Royal Society Sir Henry Dale Fellow and is supported by Kavli Foundation Dream Team project and Isaac Newton Trust. JO'K is a Wellcome Trust Principal Research Fellow. Read the full paper in Science: 'Local transformations of the hippocampal cognitive map' By Julija Krupic et al.